How to Glue Hard Body ABS Plastic?? Thread: How to Glue Hard Body ABS Plastic?? What is the best glue for hard body ABS? I just used a soldering iron when I bobbed my hilux bed... is there other options? I am adding some comp to my hilux... So I cut the doors but want to fill in the door to make it look thick... Is styrene the best for this? I guess my ultimate question is can I glue styrene to the ABS hardbody? Thanks ive been scouring threads and you tube videos! You can glue styrene to ABS. The S in ABS is styrene. Lots of us like to use MEK as the glue. Actually it’s a solvent that welds the plastic. You find that in the paint thinner section at the hardware store. Do you recommend any place in particular thats a good vendor... I tried looking through the SBG Vendors and saw so far only LOOPS RC has some styrene but no MEK? I see they have CA glue? 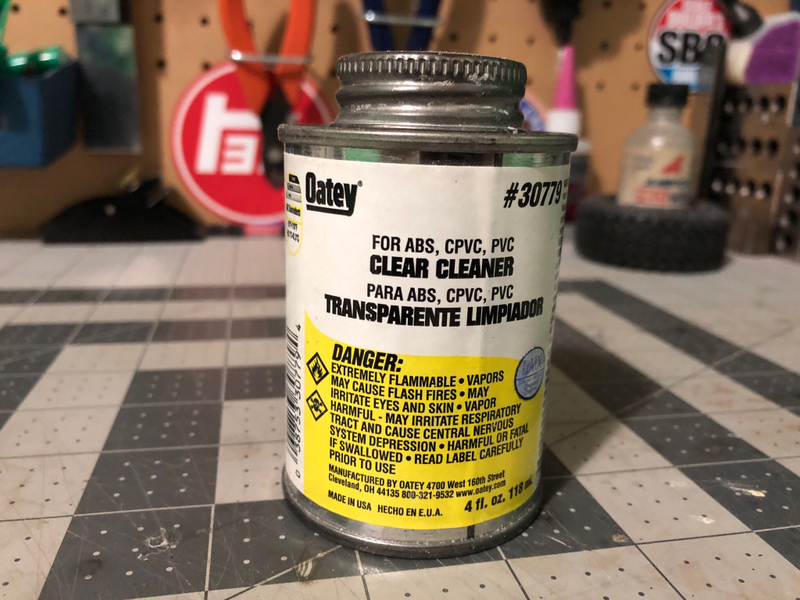 Is this a similar glue? A vendor for MEK? Lowe’s or Home Depot. CA (cyanoacrylate) is commonly known as regular ol’ super glue. I would not recommend that for styrene to styrene applications. The bond is too brittle because of the slickness of the plastic. I've used MEK on my Corvette FIA GT3 project and my Fat Cat Jag Speedster. Both were Monogram 1/8 bodies and were shortened and required a strong bond. I did some reinforcement underneath with excess plastic and all of it was bonded with MEK. it has been great. One thing I did was to take plastic shavings from sanding scraps of the body plastic and mixing it with MEK to make a butter of sorts and used that for do a preliminary fill of the joints so they wouldn't flex and so that the regular putty used over the top to hide the joint wouldn't be prone to cracking. MEK is Methyl Ethyl Ketone. Use a mask and good ventilation when applying as the vapors will give you a head ache. Haha... Do yall put it in sumthin else ? A gallon will last you a lifetime. 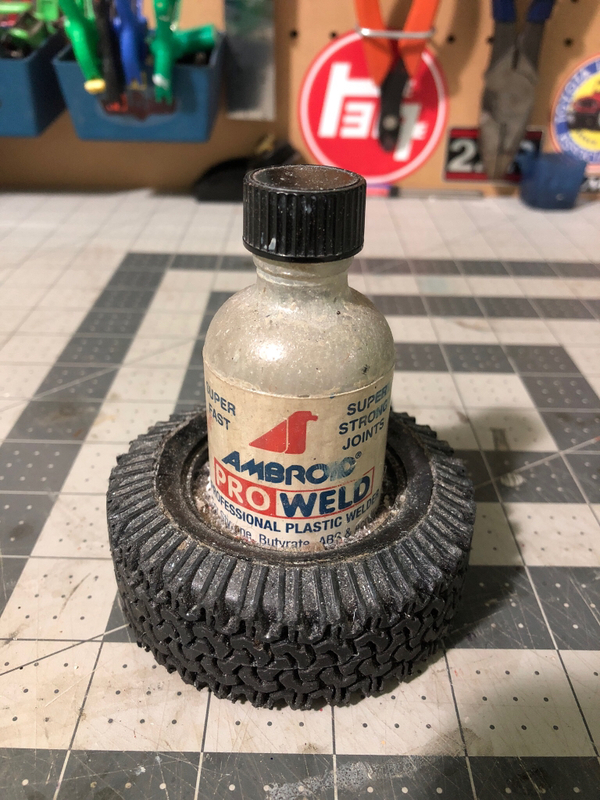 I keep mine in an old Ambroid Pro-weld bottle. Has a little brush in the cap. Stuck it in an old tire so I don’t spill as easily. If you want a wimpy sized bottle of solvent you can get micro mark “same stuff”. But for the price of 8oz of that you can get a gallon of MEK. Or try clear PVC pipe cleaner. Secret ingredient is MEK. And it also has acetone in it which also melts plastic. And your lungs. And probably your brain. Last edited by pardonmyn00b; 09-20-2018 at 02:23 PM. Haha.... Thanks for the help..